Patients need not fret– we will sit down with each patient and go in-depth about all of the details with that specific patient’s procedure. When it comes to full mouth reconstruction, each patient will need a treatment plan that is slightly different than another. Customizing the treatment to each individual in this way helps us ensure that the patient is completely satisfied with the result. There are many reasons why a patient may need to undergo full mouth reconstruction, including infection, trauma, and long-term wear. Schedule an appointment or call us to learn more at (925) 833-6200. In a lot of cases, the patient may have experienced a traumatic accident and require a chipped tooth to be removed, also concurrently replacing another tooth that fell out. 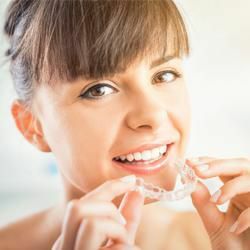 Because accidents can happen at any time, it is very difficult to prepare for the possibility of damaging multiple teeth. 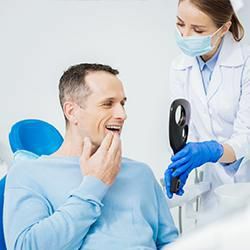 With full mouth reconstruction, a dentist will be able to repair the mouth while simultaneously repairing the functionality and appearance of a patient’s teeth. If a patient suffers from an accident that causes damage to teeth, it is necessary to seek an emergency dentist as soon as possible. A nurse at a standard emergency room will only be able to treat the wounds but not the actual condition. At Sharma Dental Center we will find the best treatment for each individual and recommend options that help to repair the damage. Many patients assume that their only option will be one that only imitates the appearance of a natural tooth. Furthermore, they assume that the patient will have to practice caution when eating for the rest of his or her life. 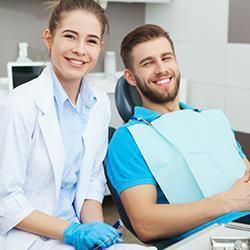 In actuality, we can provide possible treatments such as dental bonding, dental implants, dental crowns, dental bridges, dental veneers and more to help repair the functionality and appearance of the tooth. 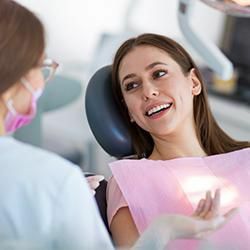 After a full mouth reconstruction is performed here at Sharma Dental Center, our patients will be able to eat what they like and smile confidently since our repairs are sturdy and long-lasting. There is no need for a patient to live with a damaged or cracked set of teeth. A patient may also lose multiple teeth to tooth decay (dental caries), gum disease or other infections. Upon infection, the dentist will do everything in their power to prevent spreading from happening. However, some patients may allow the infection to spread by not visiting the dentist at least once in every six months. the possibility that an extraction will be necessary if the infection spreads to the tooth. A root canal is one option to treat the tooth if the patient has an infection. This procedure allows the dentist to clean the area and remove the infected pulp. After the root canal, we will use a dental filling to plug up the hole. We may recommend a dental implant in the cases where the tooth is removed due to infection. This dental implant is a titanium post that bonds with the jaw bone through a process known as osseointegration. We will also fix a dental crown on top of the implant to create a natural-looking and sturdy tooth. If you have an infection affecting multiple teeth, our dental experts at Sharma Dental Center will recommend the best option for repairing one’s teeth and treating the infection. Feel free to check out what others are saying about our Full Mouth Reconstruction and restoration services on Yelp: Full Mouth Reconstruction Dublin. Unfortunately, proper dental care is not a common part of daily life for some people. When one chooses to not participate in proper dental care, teeth tend to wear down much more quickly as a result. Acid from certain foods, types of beverages, citric acid, acid reflux, grinding and more are all causes for a patient to lose their teeth more quickly. Here at Sharma Dental Center our team of dental professionals can closely monitor the teeth at least once every six months and help patients keep healthy smiles. We can use full mouth reconstruction to address multiple issues for patients who have teeth that are wearing experience these issues on a regular basis. Note that the above are only a few of the possible treatment options. 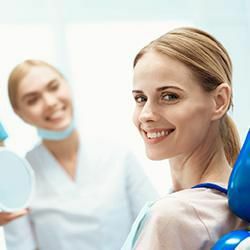 The main difference between a cosmetic dental care and a full mouth reconstruction is that a full mouth reconstruction is a necessity, not a choice. Our team of dental professionals are skilled in full mouth reconstructions and will ensure that the final product is to the patient’s liking. The price of full mouth reconstructions is a big concern for some patients. However, the longer a patient goes without the necessary treatment, the greater the pain and risk. For example, an adult who loses a tooth and does not seek treatment will cause the jaw to weaken over a period of time. If the jaw weakens enough, there will not be a way to install a proper dental implant in the gap. In some cases, a gap can become infected just as a tooth can– especially if the individual does not keep the gap area clean. The full mouth reconstruction process will spread over a period of multiple appointments to customize the restoration and install it. Patients will find that the wait is well worth it since the restoration will give back the full and complete functionality of the teeth. We will be precise and careful during the entire installation process, ensuring that each restoration is complete to perfection. 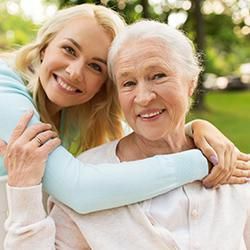 If you, a loved one, or a friend are in need of a full mouth reconstruction for any reason, call Sharma Dental Center immediately at (925) 833-6200 and schedule an appointment today. Our staff of dental professionals will go over all the questions and concerns that you may have prior to the appointment. Once you arrive, we will ensure that you have a complete understanding of the procedure itself and what happens after. Call and begin a new life today with a full set of natural-appearing, functional, and healthy teeth.